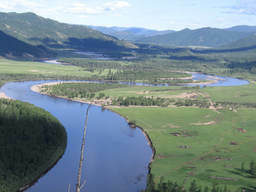 The Mongolian-American Aquatic Ecology Research Initiative is a group of scientists dedicated to understanding and conserving Mongolia's unique lake and river ecosystems. The Blue Pearl from RU Center for Digital Filmmaking on Vimeo. December 2018 - We're now recruiting our student team for summer 2019! The deadline for graduate student applications is January 2 and for undergrads January 15. Students who are US citizens or permanent residents and who will still be students in fall 2019 (i.e., not graduating in the spring) are eligible. We welcome students from all majors and disciplinary backgrounds. Women and underrepresented minorities are especially encouraged to apply. ​For more information, please see Student Opportunities. February 2018 - Our American student team for summer 2018 is all set! Graduate students Taryn Kloeden (George Mason University) and Lea Pollack (UC Davis) will lead projects focused on, respectively: (1) perceptions of environmental change by elders in rural communities and (2) use of fish behavioral assays to understand likely use of fish ladders. Taryn and Lea will be joined by undergraduates Laura Wiltsee (Rutgers), Sarah Smith-Tripp (Wellesley), Anna Hassan (George Mason), and Alice Beittel (UC Davis). ​Selection of Mongolian student participants will start soon! July 2013 - Talia Young, from Rutgers University, presented her research on Lake Hovsgol at the International Congress for Conservation Biology meeting in Baltimore, MD this month. Her work explores the fish food web in Lake Hövsgöl. Because Lake Hövsgöl has only ten species of fish and is exceptionally undisturbed by human impacts such as watershed development, dams, commercial fishing, and invasive species, it allows an ideal study system to compare with other, more highly impacted lakes. December 2012 - Five Mongolian scientists, students, and park rangers visited Rutgers, DC, and NYC on a training trip sponsored by USAID. 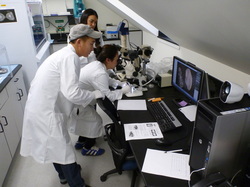 Mendee, Tsogoo, Amaraa, Jagi, and Chantuu spent 10 days in the US, including five days of training in field and laboratory research methods and data analysis techniques. 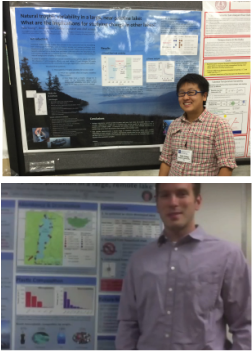 The group also traveled to Washington, DC where they presented their research to USAID and NSF staff. 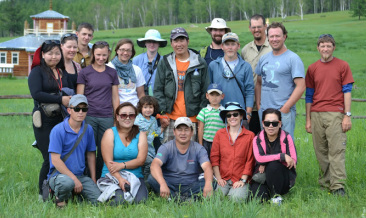 During the trip, the Mongolian visitors met with US based MAAERI researchers and students. October 2012 - The first IUCN red list assessment for Mongolian taimen (Hucho taimen, the world's largest salmonid) was released, along with assessments for two related species in the genus Hucho. Mongolian taimen were listed as "Vulnerable" based on contraction of their range in Russia, Mongolia, and China. This assessment was the result of an international taimen symposium held in New Zealand in December 2011. MAAERI scientists Zeb Hogan, Olaf Jensen, and Tsogtsaikhan Purev contributed to the assessment. Read the New York Times Green Blog article on the IUCN listing. September 2012 - Kyle Hartman (West Virginia University) and Olaf Jensen (Rutgers University) complete the first measurements of respiration rates of Mongolian taimen, lenok, and Baikal grayling. Measurements of respiration rates help scientists understand how these fish species are likely to respond to warming water temperatures associated with climate change. 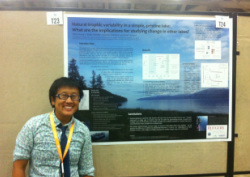 August 2012 - Talia Young (Rutgers University) presented her research on the Lake Hovsgol food web at the annual meeting of the American Fisheries Society in Minneapolis, MN. Talia's research uses stable isotopes of nitrogen and carbon to understand predator-prey connections among Lake Hovsgol fishes, zooplankton, and benthic invertebrates like snails and aquatic insects. The broader goal is to better understand the resilience of food webs in pristine lakes like Lake Hovsgol.